Celebrity status tanning accelerators help give your skin natural, bronzed results. Hypoallergenic Gluten, Oil, Paraben, Wheat, Vegan & Nut Free. Ginger & Aloe Evens out skin s tone while keeping your skin ultra hydrated. Caffeine Extracts Energize, firm and tighten the skin. Cotton & Rice Extract Soothe and soften the skin without irritation. Give your skin the royal treatment with The IT List ! This exclusive formula will darken the skin without the use of bronzers and is free of glutens, nuts, wheat, oil and parabens. Added skin softeners keep you hydrated and allow your tan to last days longer. 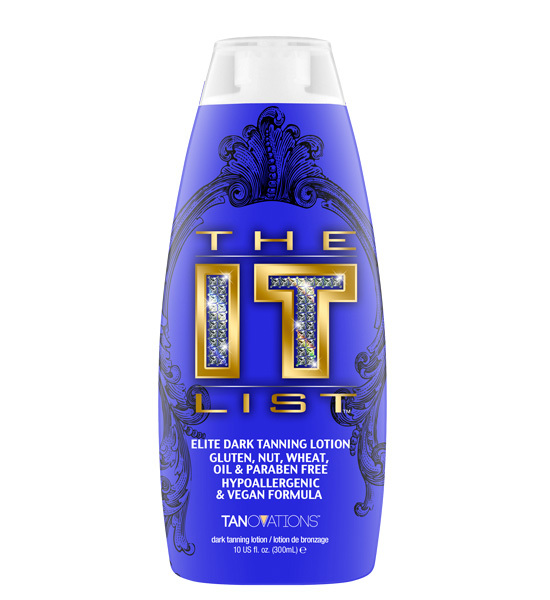 This vegan blended, hypoallergenic formula, makes this dark tanning lotion perfect for all skin types You must be privileged, because you are invited on The IT List !